As coffee traveled out of Ethiopia, across the Muslim world, and into Europe, Asia, and the Americas in the middle of the last millennium, it met with opposition from the world’s political and religious leaders. In 1511, it was banned by Mecca’s most conservative imams (the ban was overturned thirteen years later by order of the Ottoman Sultan Selim I). At the beginning of the seventeenth century, Pope Clement VIII called coffee “the bitter invention of Satan,” but decided, after tasting it, that he would “cheat the devil by baptizing it.” And in 1675 Charles II of England issued a proclamation shutting down all coffeehouses, as he believed the caffeine and conversation were fomenting rebellion. The proclamation was quickly overturned, and “that Newfangled, Abominable, Heathenish Liquor called COFFEE” continued its rise in popularity. Selim I and Clement VIII, two dudes who liked coffee. In addition to fostering political radicalism, the coffeehouses that began to open in Istanbul, Mecca, and Damascus in the early 16th century were open to the (male) public and featured performances by poets, sermons by mullahs, games of chess and checkers, and tobacco smoking. Outside the Ottoman Empire, coffeehouses appeared in the 17th century. Café Procope, the second coffeehouse opened in Paris, served coffee and sorbet, and was a popular meeting place of Enlightenment intellectuals: it was reportedly the birthplace of the first modern Encyclopedia. Escorted ladies were permitted in the cafe in its very earliest days, though they soon disappeared. In Germany, however, women frequented coffeehouses during this time. Hof zur Blauen Flasche, or the Blue Bottle Coffee House, opened in 1683 in Vienna. In Italy, cafes which served espresso first opened in the late-19th century. As opposed to the relaxed atmosphere of the coffeehouses that came before, espresso was drunk standing up at a bar. The first American coffeehouses arose in Italian-American neighborhoods like North Beach in San Francisco and Greenwich Village in New York. In the 1950s, the Beats, like the Ottomans, used coffeehouses as the preferred venue for poetry recitation. 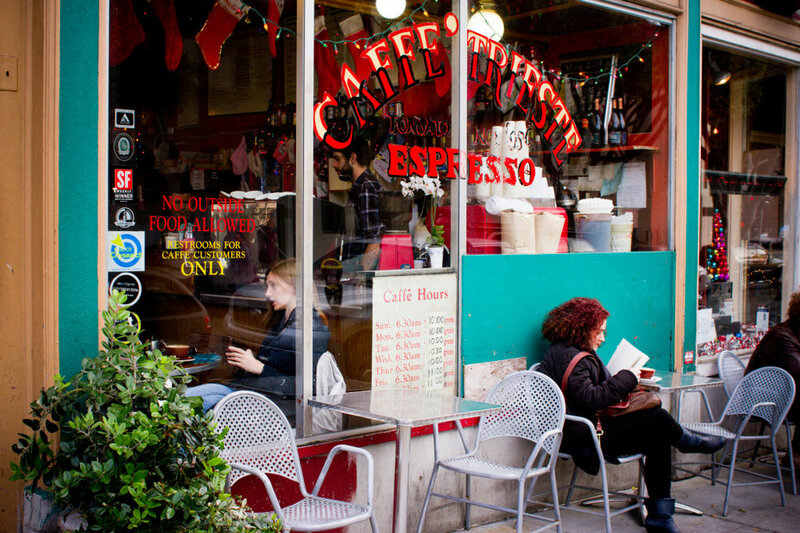 Caffe Trieste in San Francisco, opened 1956. No discussion of the coffeehouse would be complete without mentioning Starbucks, or, as it is referred to in the Red Rock office, The Great Satan (joking!). Since the 1970s, Starbucks has built many thousands of similar coffee shops around the globe. Their success has partially to do with their replicable formula for creating an inviting coffeehouse environment almost anywhere (i.e. poufy armchairs plus Norah Jones plus community bulletin board equals comfort), and has influenced American coffeehouse culture enormously. Starbucks' original Pike Place location, 1977. Recently, the movement to support local coffee shops and roasters has fostered a small revival in these community staples. Blue Bottle in the Bay Area, Intelligentsia in Chicago, and Stumptown in Portland are the standard-bearers of the Third Wave coffeeshop aesthetic: clean, beautiful spaces and high-quality, typically light-roasted coffees. Red Rock Roasters has no retail shop. Instead, we partner with independent cafes around New Mexico to provide fresh, locally-roasted specialty coffee.